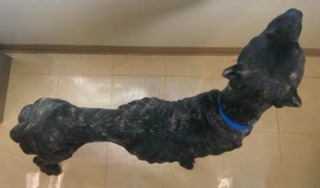 SAN DIEGO (KGTV) - San Diego County Animal Services wants the public’s help to find the owner of a dog found suffering from extreme hunger in Logan Heights. A Good Samaritan saw the dog on Dec. 6 with its ribs and spine clearly visible, said animal services officials. The person took the dog, a 5-year-old Cane Corso, to the County Animal Services shelter on Gaines St. for treatment. Dogs of this breed would normally weigh more than 100 pounds but the rescued dog weighed 62 pounds, officials said. Animal Services scores the bodies of abused pets during animal cruelty and neglect investigations. On a scale of one to nine, “one” would be extremely thin. The rescued dog scored a mere .5. Animal shelter veterinarians said the dog, which they named Bruno, is extremely friendly. Bruno has wagged his tail so much that he accidentally hit some hard objects and injured it, officials said. His tail may need amputation. The owner, if he or she is found, could face animal cruelty charges. A conviction could lead to up to three years in prison and a fine up to $20,000. Anyone with information is asked to call the department at 619-767-2740. County Animal Services started taking applications Friday for Bruno’s adoption.